This could be our most addictive smoothie yet! 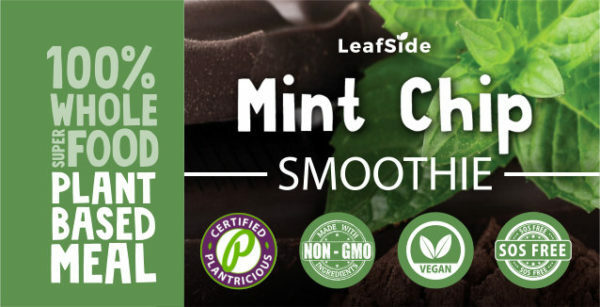 Mint Chip combines the cooling smoothness of organic peppermint, with the energizing and super-nutrition powers of raw organic cacao nibs, topped off with the rich flavor of organic almonds and our tantalizing organic spice blend of ginger and cloves. LeafSide’s smoothies can combine with any savory meal (soup or savory stir-bowl) to help you complete the Daily Dozen without any work, planning, or compromise. Full Ingredients: organic peppermint, dates, organic cacao nibs, bananas, organic wild blueberries, organic almonds, organic walnuts, organic oats, organic kale, organic spinach, organic broccoli, organic black beans, organic peas, organic coconut, sweet potato, organic flaxseeds, organic brazil nut, organic lemon, organic turmeric, organic black pepper, organic mustard seed, organic herbs & spices, B12.